Website Design & Build, eCommerce, CMS System, Mobile Responsive. 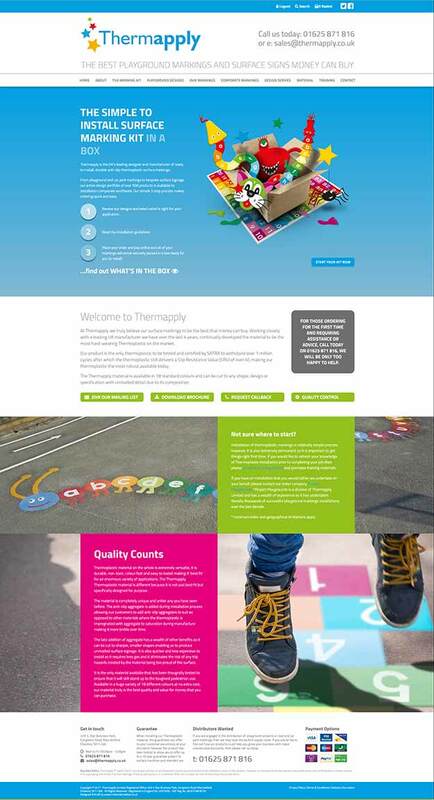 Thermapply owes its success to its drive to deliver a superior product and a continued commitment to customer satisfaction. Since we started as a small family run business in 2008, we have grown to be the most reputable supplier of Thrermoplastic products in the UK. We have continually developed our material, pioneered new manufacture techniques, done years of research and development to allow us to expand into new markets and always retained a strong focus on customer satisfaction at all times. Every member of our team has unrivalled product knowledge so you can rest assured that when you contact us, you will always be speaking to a person who actually has relevant on-site experience. We have personally applied these products into every environment imaginable from industrial warehouses and external fire escapes to the most awkward of playground shapes, we have successfully installed Thermoplastic products into all areas.